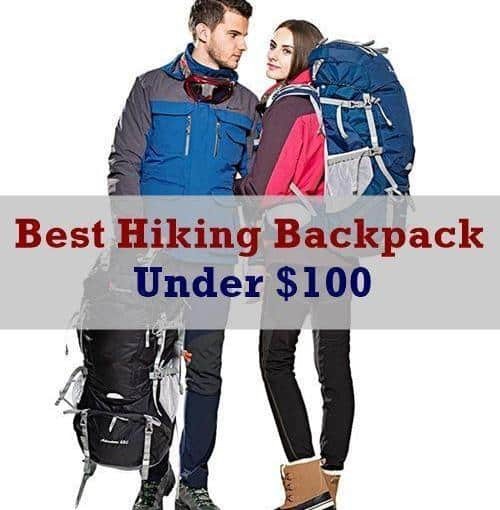 ​There are many different brands and types of hiking backpacks available. They come in a range of sizes, styles and with varying features. What determines the best backpack for hiking is the one that meets your individual needs the closest. We've reviewed twelve of the top-rated backpacks that are recommended by hikers for hikers. Here you'll find everything you need to know about them along with useful tips that tell you what to look for. 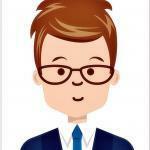 ​ Why Are Hiking Backpacks Important? ​The Venture Pal Lightweight Packable is one of my favorite backpacks for light hikes and day hiking. It's one of the most lightweight backpacks I've ever owned and it is moderately durable when used as recommended. ​The bag is remarkably light before filling with your hiking essentials. The total weight is just 0.7 lbs. ​It's resistant to moisture so if you're hiking in the rain, the contents of the bag will be protected from moisture damage. ​The bottom of the bag is reinforced for extra strength which makes it more resistant to tears and rips from excess weight or friction from the contents shifting when you're hiking. ​This backpack is comfortable to carry because of the mesh shoulder straps that let air flow in. This helps to prevent sweat from forming. There is enough padding to protect your shoulders from rubbing and irritation. Light back that's ideal for day hikes and light duty. ​​​​​​Padding makes it comfortable to carry all day. Water resistance makes it work well for protecting contents when there's a light rain or mist outside. Reasonably pricedThis pack is one of the more reasonably priced bags that doesn't skimp on quality​. ​Some users were not pleased with the durability of this bag. When weighted too heavily or with sharp objects it can tear and fail. This backpack is great for taking light hikes. It is durable when used as recommended, but you shouldn't go with this option if you're taking a trip that requires packing a lot of heavy equipment. The bag is best for light use. The warranty on this bag is exceptional though. It comes with a lifetime guarantee of quality. When the backpack isn't in use it folds up into a small size that can fit inside a large pocket. It'ss one of the lightest packs on the market today weighing just .46 pounds. That's less than a half pound empty weight. This backpack will hold between 20 to 33 liters of weight. There are several pockets and compartments to separate and organize items, plus a large main space for storing larger items. This is a nice bonus feature. The carabiner clip lets you attach things to the backpack to make it easier to carry more essentials. Very comfortable to carry because of the lightly padded straps​. ​The inside liner has a tendency to tear after several weeks of use. The warranty will cover any material defects. ​This is an amazingly strong and light backpack for hiking. Although some users had issues with the lining, most gave it high ratings for strength and durability. Overall, it comes highly recommended for modern heavy-duty use. ​The Teton Sports is far from being a basic backpack. It's loaded with useful features in a deluxe backpack that is heavy duty, strong, durable and dependable. This backpack offers enough room to hold a week's worth of provisions for extended hiking trips. The interior provides you with 200 cubic inches of space. You can customize the position of the pack with a torso adjustment that offers multi-positioning. It easily adjusts to fit a large range of body sizes from small to large. A cell foam lumbar pad makes this pack ultra comfortable to carry. It features molded channels that allow great airflow to prevent perspiration. This is a deluxe backpack that is made of strong materials with reinforcements a the stress points. Extra room to carry all necessities week-long long hike. Adjustable fit for any body size and style​. ​This backpack is heavy-duty and it's built sturdy but it's heavier than many other hiking backpacks weighing 5.5 pounds empty. ​This is the ultimate backpack for long hiking trips. It's strong, sturdy, spacious and loaded with useful features. It's one of the heavier packs in our collection, but it's more of a trade-off for high dependability in a high-performance pro hiking backpack. We don't recommend it for short day hikes, but it's totally awesome for anything from overnight trips to week-long excursions. ​This hiking backpack is made for high-performance and offers deluxe features for serious outdoor excursions. It's one of the most versatile backpacks available on the market today and one of the top sellers for the brand. The internal frame gives this pack a sturdy design for sustaining a heavy load and distributing the weight evenly for greater ease of carrying. 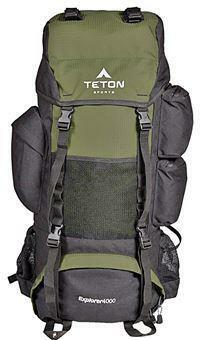 ​The interior offers 4,000 cubic inches of room for one of the largest capacity backpacks available. Fully customizable straps let you adjust the way you carry the backpack for the perfect level of comfort. Strong materials and sewn together with reinforcements at the pressure points to make this backpack highly reliable so it won't fail you when you need it the most. Sleeping bag compartment is ideal for packing camp bedding and warm clothes. 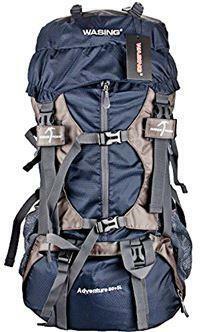 ​This is a heavy pack that and the frame is useful but it adds extra weight​. ​This hiking backpack is best suited for experienced hikers who are used to carrying a heavy load. It's a deluxe model for high-performance use that is packed with great features for carrying multiple days' supplies. It's comfortable and fully adjustable but not the best choice for day hiking. ​​The Mountaintop Internal Frame Backpack is ideal for long hikes when you need a dependable and high performing pack to carry multiple days worth of provisions. The materials used to make this pack are strong and it's designed to hold up under a heavy load. The YKK zippers open and close smoothly and are resistant to breakage​. The interior of the pack will hold up to 65 liters of provisions. You can pack a week's worth of supplies easily, plus personal items. In addition to strong zipper closures, buckle closures give you alternative storage areas that are easier to access with a single hand. This backpack is ideal for hiking in misty or rainy days because the waterproofing keeps the contents inside dry​. ​The frame is a bit awkward if the load shifts. ​This is an ideal backpack for hikers who like the framed styling. It's not the preferred style for all hikers and it may be too heavy for persons with a lighter frame or limited stamina but it is great for seasoned hikers who like to carry all necessities on their backs. ​The Wasing 55L is a deluxe hikers backpack that is designed for mountaineering adventures.It is packed with features that make it the ideal choice when reliability matters. The compartment is good for securing items separately and it allows fast access to the divided bottom portion of the backpack. This pack is great for all weather use because it keeps the contents dry when its misty or rainy outside. The molded foam back panel adds comfort and prevents abrasions from backpack rub. There's extra padding to prevent items on the inside from irritating your back. Airflow channels built into the back panel help to keep your back cooler and they help prevent perspiration. ​Adjustable aluminum frame bar adjusts to the shape of your back for an ideal fit. ​This is a heavy backpack and it takes a lot of stamina to carry it. This is one of the most versatile hiking backpacks available. It's strong for heavy-duty use and it's fully adjustable to fit any body style. It's ideal for extreme backpacking if you're used to hiking and have a high level of stamina. It's not recommended for novice hikers or for light day hikes because of the weight. If you're into extreme hiking, we highly recommend this as our top pick. 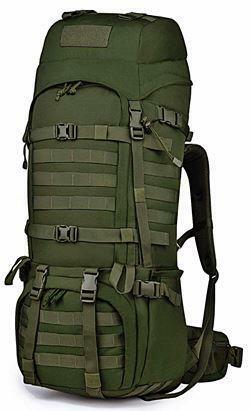 ​This is a tactical military molle rucksack type backpack that is an ideal solution for hiking, camping or traveling. It comes with a rain cover and a high-quality closure system. Intended for serious hikers, campers and survival situations. This deluxe feature is hard to find on the average hiking backpack. It allows you to hang a variety of tools, poles, sleeping bags, tents and other items for heavy-duty preparation. Strong and durable materials with heavy-duty construction make this backpack highly reliable and suitable for survival and mountaineering hiking excursions. A built-in hydration compartment is large enough to hold a water bladder of up to five liters for extreme hiking and long-term treks. This tactical pack can hold up to 65 liters of provisions and has additional accessories for suspending items from the pack. ​This is the perfect hiking backpack for survival situations, extreme hiking and long camping trips where access to the camp spot is by foot. The pack holds enough provisions for several days and the Molle webbing makes it possible to suspend additional camping essentials from the pack for comfort at the camping site. The only real drawback is that this pack is heavy and it's intended for more extreme hiking situations. ​This is the perfect solution for camping in rainy conditions when access to the site is by foot only. It comes with its own rain cover to offer extra protection from rainy or misty environments. ​This backpack can hold up to 50 liters of provisions which is enough for a 3 to 4-day trip. The padded back and shoulder straps prevent irritation on longer hikes and protect your skin from abrasions. 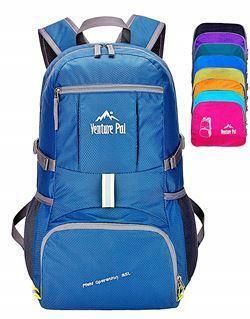 The pack can be used for outdoor hiking but it's also a size that meets the regulations for airline travel. Ideal for use in wet weather conditions. It's not only waterproof but it also comes with a rain cover for extra protection from wet climates. ​Customizable fit with 8 adjustable straps. Breathable materials help prevent back sweating on long hikes in warm weather. The large size makes it suitable for longer hiking trips​. ​This is one of the best choices for use in wet weather conditions. It's perfect for use in climates that have high humidity, rain or mist because it features a waterproofing system that is superior to most other hiking backpacks. It's a little on the heavy side but if the weight is distributed well, this should help. 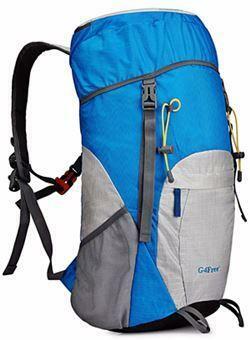 ​The G4Free is a medium capacity backpack that is ideal for light to moderate traveling and hiking trips. Its light weight reduces the burden and its compact size make it easy to store when it's not in use. The 40-liter storage space is ideal for carrying a small hammock, clothing, a towel and a 1 to a 2-day store of provisions for light hiking and camping​. The total weight of this backpack when empty is just 12.7 ounces. It's less than a pound and it is more comfortable to carry than some of the other heavier or bulkier backpacks. The materials used to make the pack are durable and strong nylon that is resistant to tearing and fraying. Padding in the shoulder straps makes it more comfortable to carry and it helps to prevent irritation from rubbing. Lightweight to reduce the burden for longer hiking distances​. This backpack is very lightweight and not as well suited for more intense hiking excursions. 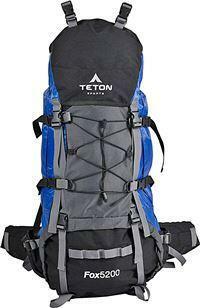 This backpack is recommended for light to moderate hiking trips that don't require the maximum space for longer trips. It's best for light trips of one or two days at the maximum. It shouldn't be packed too tightly or it can stress the nylon materials. It is strong when used for light to moderate hiking conditions. ​The Teton Sports Hiker 3700 offers ultralight comfort with a strong construction in a backpack that is suitable for a variety of travel situations. ​The backpack is waterproofed and it also comes with a sewn in rain cover for extra protection from the elements. This backpack is light enough to use on day trips and big enough for extended hikes of several days. The Teton Sports offers enough room for up to 4 days worth of provisions and gear for long hiking, camping and traveling adventures. 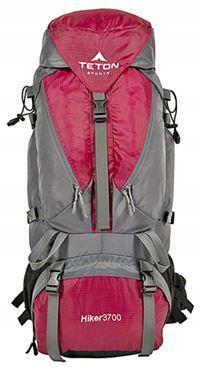 This pack is ultra light in weight so it won't create a burden on extended hikes. The innovative design provides a split waist belt with thick padding and bottom hip adjustments so you can achieve the perfect fit. Sleeping bag compartment ideal for sleeping gear​. Some of these units have had buckle failures but the company fully covers these events through a generous warranty program​. 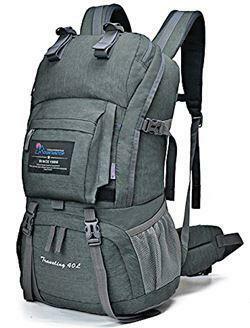 This is a great hiking backpack for moderate duty trips. It's among the lightest for its size. Although some of these packs have had buckle failures, the majority of users report no issues. It's great for traveling, hiking camping and a good choice for men, women and youth because of its adjustable sizing. 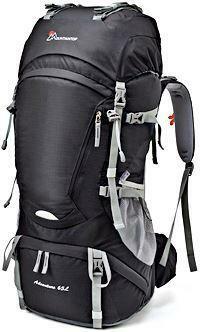 ​This is a large capacitys hiking backpack with plenty room to carry gear and provisions for up to 4 days. It's fully waterproof and the ideal camping companion. The backpack is treated with waterproofing to keep out moisture in wet and damp weather conditions. It also cmes with a rain cover for extra protection when the weather is foul. Six adjustable straps make this backpack suitable for most body sizes and shapes. You can also hand a mat, hammock, tripod, sleeping bag or other gear from the straps. The hydration compartment can hold a water bladder for hydration. This pack can be used for hikers, campers, backpackers or students because there is a built-in compartment that will hold a laptop up to 17 inches. This backpack is sturdy but it shouldn't be overpacked because heavy loads can lead to tearing of the lining. 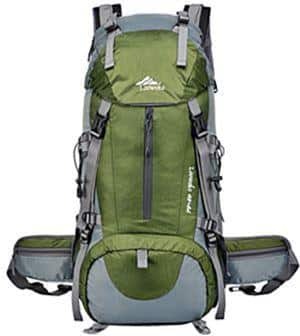 This is an ideal backpack for light to moderate hiking or for airline travel. It's medium duty in construction making it ideal for day or overnight hiking trips. It's versatile enough to use for traveling, hiking, camping or for the classroom. It's not extremely heavy duty so care should be taken to avoid overpacking. 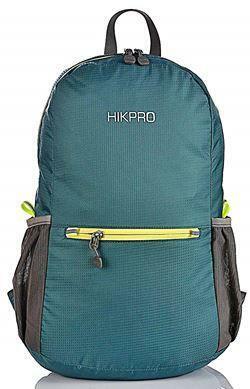 The Hikpro 20 liter is the perfect light duty backpack for day hiking for men, women and youth. It's light and water resistant and large enough to hold provisions and personal items for nice day hike in the mountains. This pack is resistant to water and suitable for use in moist, misty or light rain conditions. It keeps the contents dry when the weather is wet. This backpack reduces fatigue with lightweight materials and construction that weighs a total of 7.5 ounces when empty. The sholder straps are made of breathable mesh material for good ventilation that helps to keep your body cool when you're hiking in warm weather. Light padding in the straps prevent rubbing or irritation of the skin and the extra width of the straps distributes the weight evenly. Materials are a little too light and may tear when overpacked. 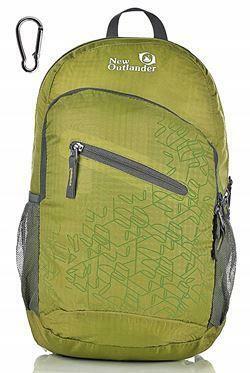 ​This pack is ideal for day hikes and light traveling. Its one of the lightest packs available. As long as care is taken not to pack too tightly or heavily, the materials hold up well. It's not a particularly versatile backpack but it's ideal when you need a light and comfortable backpack for light use. ​There are some important considerations to make before you go out and buy a hiking backpack. These are the tips that will help you to know what to look for before you shop. ​​Size matters. If your backpack is too large it may overwhelm you and cause you to carry extra weight that is unnecessary. It should be a size that is comfortable for your body size to carry. If it is too small, you won't have room to pack everything you'll need for your trip. The first thing to do in figuring out the best size is figured out how many days you'll be gone, how much food you'll need to pack and so forth. Once you make a detailed list of the essential hiking gear and equipment you'll be taking along, including food, a backpacking tent and warm clothing, you'll have a better idea of the size that you'll need. ​​The ideal backpack will be as light in weight as possible. Heavy backpacks can become a burden quickly. Choose a backpack that is made of the most lightweight materials possible. Most hiking backpacks advertise their total weight which makes it easier to find the weight before you add contents. This will help to make your hike more enjoyable. ​​A cheap backpack that is made of poor quality materials may be very light but that doesn't mean that it's a good deal. It's very important to have a backpack that is made of strong and durable materials. It should be well constructed and sturdily built. A cheap backpack that tears when you're miles away from civilization could cause a dangerous or at least miserable situation for you. ​Backpacks come with a range of special features and designs. Some offer back support, others have special configurations for the pockets and so forth. The features are the things that make them different. Some have frames to carry a heavier load and make them stronger and others have a combination of the supportive shoulder or belly straps. Choose the hiking backpack with the features that you will find the most useful. ​When you're hiking in the wilderness, your backpack is essential equipment. It will hold everything that you need to carry with you. Your safety and comfort depend on the contents of your backpack. You need one that is dependable and will be large enough to carry all of the things you could possibly need for your trip. Your backpack will contain your food, sleeping gear, warm clothing, cooking gear, first aid kit, and other necessary items. This is why it is so important for you to choose the right one. These are the 12 best hiking backpacks on the market today. Each comes packed with features that make them unique. Some are intended for heavy-duty hiking situations and mountaineering or survival situations. Others are intended for moderate use for trips of up to 2 to three days while others in our review are intended to be very light and comfortable to carry for day use when you don't need to carry a lot. ​We've given you a broad range of styles, brands and types to choose from. We encourage you to take your time and browse through our recommendations to find the perfect backpack to meet your needs.